Are you seeking compassionate counsel and diligent representation from a family law attorney? Has your marriage all but ended and you need a divorce lawyer to make it official? Are you concerned about taking care of your kids, including child custody and child support? 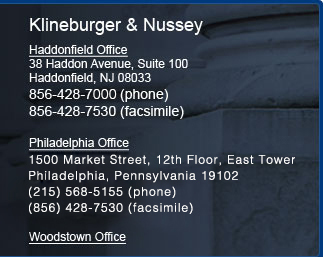 From offices in Haddonfield, New Jersey, and Philadelphia, Pennsylvania, the law firm of Klineburger & Nussey provides reduced rate initial family law consultations. Call us at (856) 428-7000 or send us an e-mail to discuss your personal needs and legal objectives. Led by certified matrimonial law attorney D. Ryan Nussey, our law firm provides experienced family law counsel to individuals and families in the areas of adoption, prenuptial agreements, and divorce. Our divorce representation spans child custody, child support, alimony, property division, modifications, enforcements, and visitation. Our family law attorneys listen patiently to the needs of our clients and empower them to make informed decisions throughout their divorce proceedings, including mediation. They will be diligent and thorough in their efforts regarding alimony and the equitable division of assets. We understand that many times our clients' main priorities in a divorce are the care and custody of their children. As such, we will work toward establishing child custody, child support, and visitation agreements that are in the children's best interests. Has the relocation of your ex-spouse caused a wrinkle in your custody and visitation schedule? Has your former spouse stopped sending child support or alimony payments, or refused to bring your child to your home as agreed? Has there been a substantial change in circumstances that may necessitate a change in custody or support? Our lawyers can help modify or enforce existing family law orders. Our criminal defense experience bolsters our ability to handle family law cases involving domestic violence. If your marriage is in danger due to domestic abuse, we can help. Our family law attorney can assist all parents seeking to adopt, including stepparent adoptions, private adoptions, and international adoptions. At Klineburger & Nussey, we are there for clients throughout their time of legal need and are fully committed to resolving each family law case in a wholly efficient and cost-effective manner. Please contact us to schedule an initial consultation to discuss your situation. Over the years we have successfully represented our clients in appeals when an unfair decision has been rendered. Several of the opinions have resulted in published opinions, including the case of Emma v. Evans. We have the attorney knowledge and experience to assist you with your appellate issues.